Top fly fishing guide in Montreal recommended by Freshwater Phil. 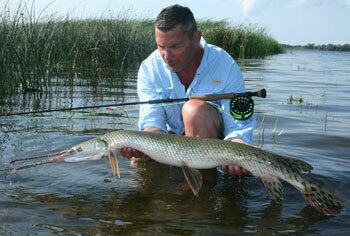 Ari: Fly fishing for muskies, pike, bass, longnose gar, salmon/steelhead. Ari specializes in fishing in hard to reach waterways. Using a combination wading and a small inflatable Zodiac, he'll take you on a personalized outing attempting to put you on to the trophy of your dreams using either conventional or fly fishing techniques. Specs: Combination of wading, shore fishing and using 10 foot inflatable Zodiac. Best time: Spring thru fall. Gear, tackle, and food provided, catch and release only. Daily rate: $375 per day, 2 people maximum. Tips welcome. Contact Ari about a guided fishing trip by clicking here.